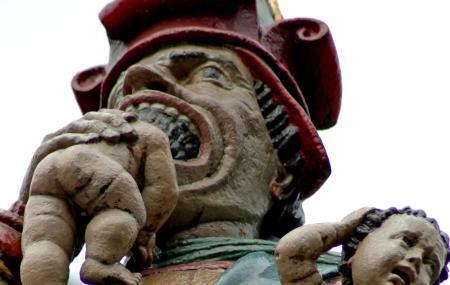 The Child Eater Fountain (Kindlifresserbrunnen) or the Ogre fountain is one of the most popular fountains of Europe. The fountain has more than one interesting stories to its existence. Some believe that it is a symbol of the Greek God Cronus who ate his own kids to prevent them from overthrowing his prophecy in future, while others believe that it was created to frighten disobedient kids. Some also believe that it reflects Jewish people who used the blood of children for their religious practice. However, the real reason behind the existence on this fountain is still not known. Irrespective of the many myths/stories behind this fountain, it is a gorgeous attraction today attracting a lot of visitors in the city of Bern. How popular is Child Eater Fountain? People normally club together Botanical Garden and Zytglogge while planning their visit to Child Eater Fountain. Pretty creepy but very cool piece of sculpture! There are so many differing opinions on what the artist had in mind when he made this. It's best to Google them haha!. But if you're walking by..its definitely eye catcher! Verg scary but at the same time so nice to go and visit if you know the story behind the place it is even more fun to see . Look af the details and then it is even more beautiful. If you are walking from the Main Train Station, it will take you about 10-15 minutes to reach Kornhausplatz. This is where you will find this fountain, which dates from the XVI century. Even though it is not the only fountain in Bern, it is one of the most visited ones. It might be shocking to some to see a fountain of an ogre eating children...but that is what it is. There are several theories regarding the meaning of the fountain, but as of today they all remain as theories.